Based on a framework that integrates job demands-resources theory (Bakker and Demerouti in J Manag Psychol 22:309–328, 2007), social cognitive theory (Bandura in Social foundations of thought and action, Prentice-Hall, Englewood Cliffs, 1986; in Pervin L, John O (eds) Handbook of personality, Guilford Press, New York, pp 154–196, 1999) and regulatory focus theory (Higgins in Am Psychol 52:1280–1300, 1997), the purpose of this research is to investigate the relationship between perceptions of organizational politics and subsequent moral disengagement and unethical behavior. We conducted a laboratory study and also collected data in two separate surveys 6 weeks apart from 206 individuals working full time to investigate the relationships presented in our model. 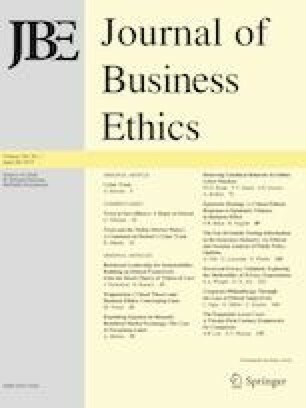 In both studies, we examined the direct relationship of politics perceptions on unethical behavior in organizations as well as the indirect relationship through the influence of moral disengagement. We investigated the moderating effect of regulatory focus (prevention-focus and promotion-focus) on the relationship between moral disengagement and unethical behavior using the survey data. Results indicated that perceptions of politics were significantly related to our mediator, moral disengagement, which was significantly related to our dependent variable, unethical behavior. However, only prevention-focus moderated the relationships examined. Implications for future research and managerial practice are discussed. This study was funded through the Award of University Professional Development funds provided to Matthew Valle and Suzanne Zivnuska. No outside funding was obtained/used.